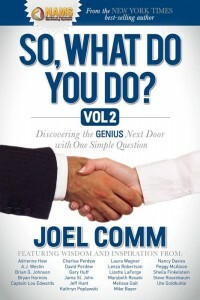 So What Do You Do? | Kay Rice, M.Ed. contributors, including me! I contributed a chapter entitled, “Learning to Live from the Heart” which is an abbreviated version of a chapter in a book I am working on now. 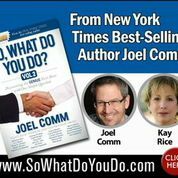 See me at the right with Joel Comm and David Hancock, owner of Morgan James Publishing. My journey is a story about learning to live from the heart. 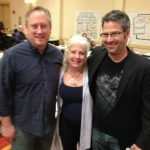 If you would like to learn what it is to truly use the power of intention to dream the life you want into existence, then my story may interest you. My journey has taken me from health & fitness to learning key success principles used by the very successful, to learning mind-body-spirit principles and techniques, to traveling to South America to live while learning the spiritual and healing traditions of the Andes. 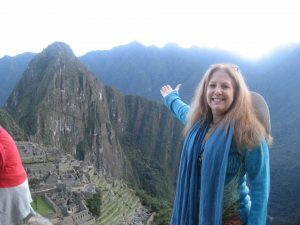 I’ve been blessed to have many gifted teachers along my journey such as Deepak Chopra and David Simon at the Chopra Center, Jack Canfield, as well as the humble healers and shaman I met while traveling in Peru and Bolivia. I’ll share my chapter here, and you may download it in pdf form if you wish. My trip to Peru in 2012 took on a life of its own. It started before I left the United States; situations, circumstances and opportunities indicated that a force was at work directing my life. Having learned it is best not to argue with the Universe, I stood back and watched as my life unfolded. I was a home manager and the house had sold and the company didn’t have a new one yet—so all my belongings went into storage. The new contract I had been working to close fell through—it was something I could have worked on ‘virtually’ while traveling. When my computer crashed the week before I left, I was grateful. Why? Because I had time to have it repaired before I left and it was running better than ever. Then it crashed again the day after I arrived in the Sacred Valley of Peru. Apparently the Universe had decided I needed to focus on my journey rather than the Internet and my electronics. I received an invitation to go to Machu Picchu before I left the U.S. I didn’t have to plan a thing. The guide, the hotel, and all the travel arrangements were made for me. All I had to do was say “yes”. Imagine, a trip to Machu Picchu planned without having to even think about it! I would see Machu Picchu only eight days after arriving in Peru. I could go ahead and mark Machu Picchu of my bucket list! 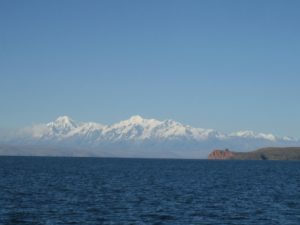 Lake Titicaca was also on my bucket list. It is located in the southernmost part of Peru and northern Bolivia. I knew very little Spanish, so it would be difficult for me to go there alone. 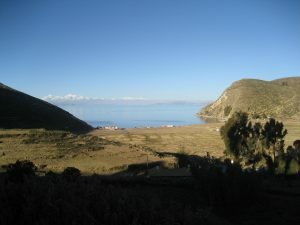 One day I was told three times that I should go to Lake Titicaca, specifically6 to the Isla del Sol, or Island of the Sun, on the Bolivian side. At the end of the day, a woman named Donna approached me and said she would be taking a group to Lake Titicaca in a few weeks. After her group left, she would travel into Bolivia and go to the Island of the Sun. She said she had received a very strong message to invite me to come with her. And so it was! I joined her group on the last few days of their tour and traveled to Puno with them. From there, Donna and I crossed the border into Bolivia. 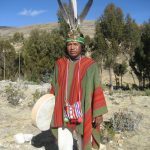 We had been given the name of a man named Rojer, and Aymara Shaman who lived on the remote side of the Island of the Sun. We were to take a ferry from the peninsula of Copacabana to Cha’lla to meet Rojer, who spoke no English. We were dependent on Donna’s Spanish for direction. Earlier in the day Donna had commented that she wanted to improve her Spanish so instead of merely thinking she understood what people were saying, she wanted to be sure she really understood. However, as a result of some miscommunication, we missed the commercial ferry to the island and had to charter our own boat to our destination, Cha’lla. We did not know there is a Cha’lla 1 and a Cha’lla 2. When we arrived at the Cha’lla, our boatman quickly unloaded our luggage onto the dock and sped away. Rojer was nowhere in sight. There are no motorized vehicles on the Island of the Sun, and the terrain is steep and rocky. We had no way to contact Rojer, no way off the island, and it appeared we had been dropped off in the middle of nowhere. In the distance some children were tending animals. A boy approached us. Donna explained we were looking for Rojer. He replied, “Si, si, conozco a Rojer,”—Yes, I know Rojer—as he pointed in the direction of the steep rocky terrain in the distance. He told us that Rojer lived in a yellow house on the other side of that mountain, at Cha’lla 2; we had been dropped off at Cha’lla 1. 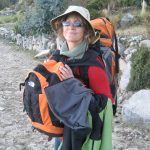 We had two weeks of luggage we were hauling on foot. We were at a very high altitude, about 14,000 feet) which made our trek much more physically challenging. We had no food, no water and no shelter. As soon as the sun set, the temperature would plummet, and it was already mid-afternoon. We were in a potentially dangerous situation if we didn’t get over the mountain and find Rojer before dak. I didn’t know whether to be amused or annoyed that Donna kept stopping to ask people to help us. It was obvious to me that we were responsible for ourselves and our luggage and no one seemed interested in taking on our problem. We didn’t have much time before the sun would set. Donna grumbled along the way, asking herself why she had brought all of these belongings and considered leaving them on the path. Even so, she is still smiling here in this photo! As we headed down the other side of the rocky path, we found Rojer on the path waiting for us.He led us to the hostel right on the beach were we would stay for the next several days. Our hosts, Victoria and Francisco, served us one of the most delicious meals I had yet eaten in South America. Delicious fish, roasted vegetables, potatoes and tea! As we finished our meal I could hear the waves lapping on the shore. As Rojer left, he told us he would be back for us in a few hours. We should be prepared to leave well before daylight in the morning. We would hike further up the rocky terrain and arrive at our next destination well before sunrise. There he told us we would perform a ceremony. It would be very cold, but he promised to build “un fuego”—a fire—for us when we arrived. direction of the newly risen sun. Afterward, Rojer asked each of what we had seen. I described an image that I did not know until later is a symbol of the eye of the condor. He looked pleased. 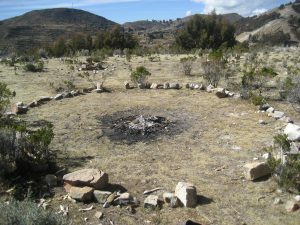 After our ceremony Rojer explained the four spiritual gateways on the Isla del Sol. We passed through the first gateway by boat. We passed through the second gateway when we were dropped off at the wrong Cha’lla and had to climb the mountain. (Maybe that wasn’t an accident after all). Today we were at the location of the third gateway, where we accepted the spiritual path. He warned, “Not everyone who accepts the spiritual path will fly! So where are your feathers?” “Where are your feathers?” he asked again as he indicated his own feathers. He further explained that if we were to fly that our first feathers would come to us; we would either find them in nature or we would be gifted them by someone else on the spiritual path;l our feathers could not be purchased. I found my feathers. Several weeks later as I was trudging down a dusty dirt road in Peru wondering if I would find my feathers and asking, “Where are my feathers?” I looked down and there they were. They were hummingbird feathers. Now I have many more feathers, some of which I found in nature one special one that was gifted to me. Not only did I find my feathers, I also discovered the magic and flow when you learn to live from the heart rather than the head.